No. 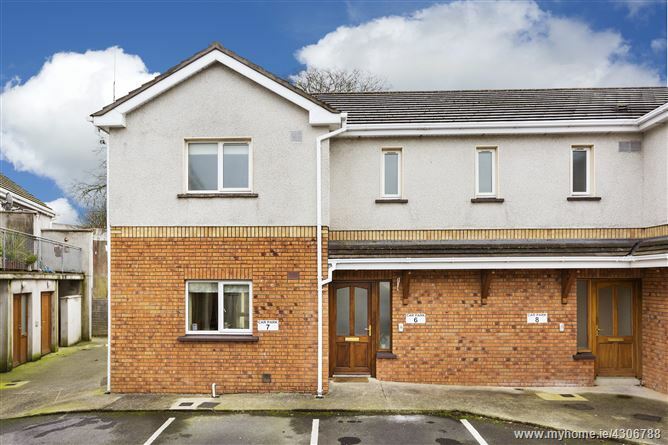 7 Oakleigh provides a ground floor, own front door apartment located right in the heart of Ratoath Village and within walking distance of all local amenities. No. 7 is an ideal property whether you are a First Time Buyer, downsizing or an investor. This secure low density and gated development is superbly located in the heart of Ratoath village with a range of retail and leisure amenities & public transport on your doorstep. Accommodation includes entrance hallway, open plan kitchen/dining, two bedrooms, bathroom and east facing patio overlooking trees. Enter hallway through laminate wood flooring with pendant light fitting. Complete with shaker style wood kitchen, worktop space and includes built-in oven, gas hob & extractor fan plumbed for washing machine and dryer. Complete with laminate wood flooring and pendant lighting. The spacious living area features a patio, laminate wood flooring and French doors leading to a patio/grassed area. Bathroom complete with W.C., w.h.b., overhead bath with shower attachment. Tiled floor, partly tiled walls. Main double bedroom with new grey carpet flooring and built in wardrobes, dressing table and overlooks the rear of the development. Pendant light fitting. Double bedroom with built-in wardrobes, dressing table pendant light fitting, new grey carpet flooring and overlooks the rear of the development. French doors leading to: Patio area and grassed area. •	Presented in excellent condition throughout to include new carpets/blinds. •	Own front door with intercom. •	Ample surface car parking space. •	Management Fees approx. €800 per annum. From Main Street, Ratoath – head northwest on R125. Turn left to stay on Main Street. Turn left onto Moatlands. Turn left – 25 m – Oakleigh. See REA GRIMES For Sale sign.